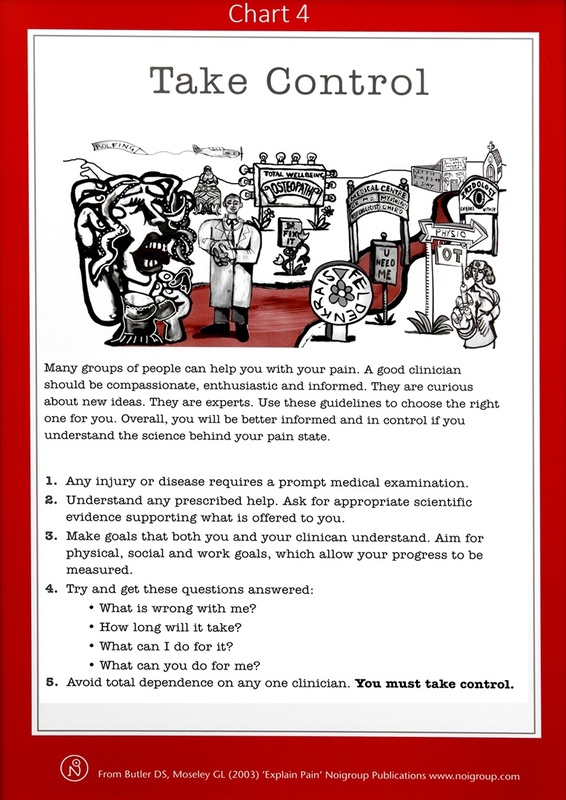 In Explain Pain Supercharged, Lorimer Moseley and David Butler proposed The Grand Poobah* Pain Theory. Pain is an unpleasant feeling that is felt somewhere in the body and urges us to protect that bodily location. Pain is one of many protective mechanisms. Others include movement, immune, cognitive, endocrine and autonomic. Pain is the only protective mechanism we are necessarily aware of and compels us to do something to protect the painful bit. Pain is modulated by any credible evidence that protection is warranted. Despite what others may think, the pain you feel is real. If you want to have less pain and feel happier with your family, work and leisure you can do something. This will take increasing your understanding and doing things differently. Staying in your comfortable belief zones, will only keep you on the rocky path to chronic pain and disability. In Touch Physiotherapy offers a dynamic approach to regaining control over your life, based on current research evidence. Life will get better as you learn more about how your brain interprets the information it receives, and how you can influence what you think and feel. Locate a clinician who is compassionate, enthusiastic and informed, as well as open to what you are saying. There are a range of medical and allied health practitioners who can help. As an experienced Specialist Physiotherapist, I have the knowledge and skills to help you understand the science behind what you feel. 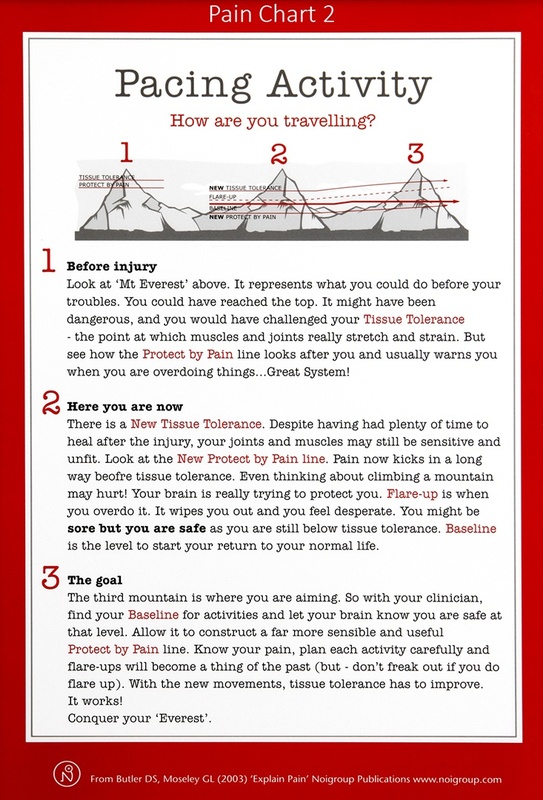 You can learn to manage pain, and get on with living in a stepwise process. Discover the steps you can take to return to an active involved life. Acute injuries and diseases require prompt medical or physiotherapy assessment if they fail to heal within a few days. Severe multifactorial soft tissue injuries may take six to twelve weeks for full repair. If your pain is overwhelming, and your emotions are out of hand, this complicates and prolongs your recovery. Chronic or persistent pain presents differently to acute pain and needs early accurate assessment with individually matched care. Before you start a new treatment ask the clinician for appropriate scientific evidence. At In Touch Physiotherapy my treatment reflects current research, and actively involves you in the recovery process. We will set goals together basing them on your physical, social and work activities. I also measure progress to ensure we are achieving what we both want. I am happy to work with your medical doctor or other practitioners to optimise your outcome. What should I ask about pain during a consultation? How long will it be before I feel improvement? Why am I still feeling pain? What methods can I use to help myself? Take control of your own recovery from Pain. Follow a dynamic pathway based on new ways of thinking and doing. Before Your Injury – life was probably more active and enjoyable. You were happy to take risks, find exciting things to do, and push your body’s tissues to the limit. Your activity placed stress on your muscles and joints in a healthy way. When you are well your brain knows your safety limits because your brain knows accurately when you move into a possible injury zone. Where are you now in the recovery path? – After an injury your joints, muscles and nerves may still be oversensitive and underused. You may perceive pain starting a long way before the tissues reach the point of re-injury. Even thinking about a movement like bending may hurt because your brain is trying to overprotect you. Learning to pace your way during an activity lowers the risk of a flare-up, with its associated feelings of frustration and despair. You are probably safe from re-injury as your activities are probably below your body’s real tissue tolerance. This may be a hard concept to grasp but knowing more about how your brain reacts to pain with help you make sense of it. Your Goals – Every sportsperson knows about pacing – we increase our activity as our minds and body adapt to new stresses. I will work with you to find your starting level for activities, and together we will train your brain to accept you are safe. Once you know what your body and mind can cope with, and are feeling more confident, we will gradually increase your activity. Flare-ups and fear will recede with practice. New knowledge and paced activity will improve your tissue tolerance and allow you to live life as you want. When your brain works in synchrony with your improved physical abilities, life will be enjoyable again. After an injury, your level of anxiety, fear and knowledge will powerfully influence your recovery for positive or negative. Your pain may worsen from a simple (or complex) injury, to where you may be suffering from persistent pain, anxiety and depression. This cycle is hard to break without assitance. You have found the best place to recover. We can work together to achieve your goals. On the chart below – Start at Injury and follow the ange of alternative paths you may have chosen from teh time you had an injury. David Butler & Lorrimer Moseley describe these paths well. Can you recognise some of the places you have been? What experiences have you had? At what location will you end up? Is your goal just freedom from negative sensations or do you have more adventurous aims? Are you ready to take a more exciting and positive way to leave your pain behind? Thoughts and beliefs form nerve impulses in your brain affecting how you feel and interpret messages from your body. Have you heard yourself thinking or saying these unhelpful comments? ‘Thought Viruses’ are powerful enough to drive your pain for longer than is needed for tissue safety. ‘These Viruses’ are more likely to prolong your pain if you don’t understand how pain works. ‘Viruses’ may increase your discomfort enough to lose sight of the value of life. 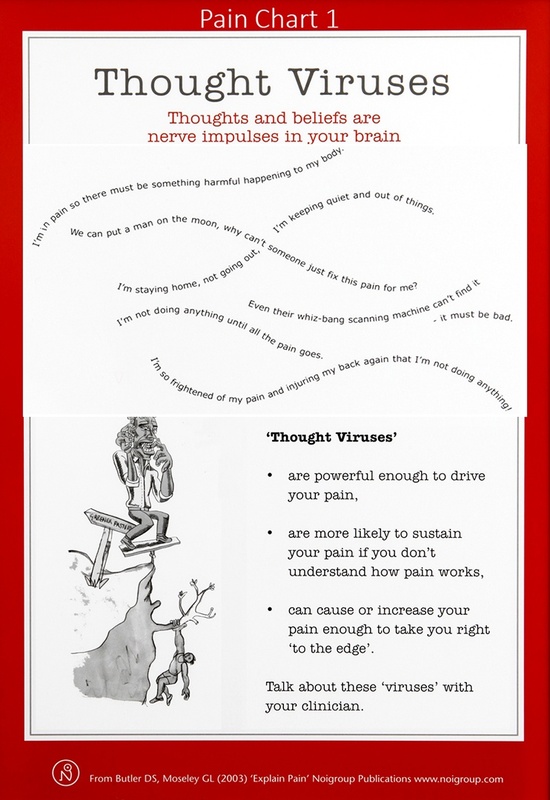 Talk about these ‘Thought Viruses‘ with your physiotherapist, psychologist or doctor. like a bowl of yeast forming gases of pain!